ST. PETER, Minn. – The Gustavus volleyball team cruised to a straight-set victory Friday night against Bethany Lutheran College with scores of 25-16, 25-16 and 25-22. The Gusties improve to 11-2 overall and extend their win streak to 11 matches. All 16 varsity players saw time on the court tonight and Head Coach Rachelle Sherden credited her team’s depth as the deciding factor. After the two squads traded points to start the first set 2-2, the Gusties scored seven consecutive points to take a 9-2 advantage. Taylor Trautman (Jr., Hutchinson, Minn.) had two services aces in the run. The early lead proved to be the difference as the two teams played even the rest of the way and the Gusties went on to win by nine. The second set proved to be the same score as the first, but the Gusties never had a long scoring run of more than three points at a time. Instead, the Gustie defense was able to sideout quickly, not allowing the Vikings to score more than two consecutive points throughout the entire set. To start the third set, the Vikings took their first lead of the night at 3-2. From that point on there were five ties and three lead changes, resulting in a 15-15 tie as Gustavus took a timeout. Sherden and the coaching staff recollected their players and the Gusties responded by going on a 5-1 run to take a 20-16 lead. Bethany got within two points at 24-22, but a kill by Claire Laakso (So., Bemidji, Minn.) ended the set and the match. 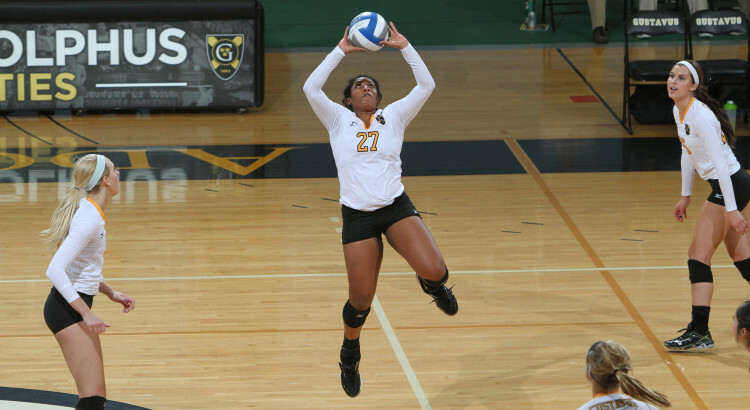 The Gusties compiled 37 kills throughout the night with 13 players recording a kill. Shaefer Rupar (So., Merrill, Wis.) led the way with seven kills on 10 attempts and no errors for a .700 attack percentage. Marisa Morgan (So., Rockford, Ill.) and Nora Holtan (Fy., Rochester, Minn.) split the setting responsibilities with 15 and 14 assists, respectively. Libero Brittany Luethmers (Fy., Prior Lake, Minn.) posted a team-best 15 digs. The Gusties are back to Minnesota Intercollegiate Athletic Conference play at 3 p.m. Saturday at St. Catherine University.